Charles Henry Holden Litt.D, FRIBA, MRTPI, RDI (12 May 1875 – 1 May 1960) was a Bolton-born English architect best known for designing many London Underground stations during the 1920s and 1930s, for Bristol Central Library, the Underground Electric Railways Company of London's headquarters at 55 Broadway and for the University of London's Senate House. He also created many war cemeteries in Belgium and northern France for the Imperial War Graves Commission. After working and training in Bolton and Manchester, Holden moved to London. His early buildings were influenced by the Arts and Crafts Movement, but for most of his career he championed an unadorned style based on simplified forms and massing that was free of what he considered to be unnecessary decorative detailing. Holden believed strongly that architectural designs should be dictated by buildings' intended functions. After the First World War he increasingly simplified his style and his designs became pared-down and modernist, influenced by European architecture. He was a member of the Design and Industries Association and the Art Workers' Guild. He produced complete designs for his buildings including the interior design and architectural fittings. Although not without its critics, his architecture is widely appreciated. He was awarded the Royal Institute of British Architects' (RIBA's) Royal Gold Medal for architecture in 1936 and was appointed a Royal Designer for Industry in 1943. His station designs for London Underground became the corporation's standard design influencing designs by all architects working for the organisation in the 1930s. Many of his buildings have been granted listed building status, protecting them from unapproved alteration. He twice declined the offer of a knighthood. 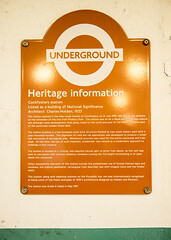 Heritage Information Cockfosters station Listed as a building of National Significance Architect: Charles Holden, 1933 The station opened in the then small hamlet of Cockfosters on 31 July 1933, the last of the stations on the extension of the line from Finsbury Park. The station was to be a focal point for a new suburb and although some development took place, areas to the north and east of the station became part of the protected London Green Belt. The station building is a low European style brick structure flanked by two small towers each with a pole mounted roundel. The alignment of road and rail approaches was developed to produce a ticket hall concourse of pentagonal plan. Reinforced concrete was used for the entire concourse and train shed. At the time, the use of such materials, unadorned, was viewed as a modernistic approach to buildings in this country. The station is located in a 'cutting' and required natural light to enter from above, so the roof was built in two levels with inclined celestory (sic) windows run-in the full length terminating in an apex above the concourse. Other noteworthy elements of the station include the predominant use of bronze framed signs and windows, the original passimeter, rectangular train describer box with integral clock and the timber seats. This station, along with adjoining stations on the Piccadilly line, are now internationally recognised as being some of the finest examples of 1930's architecture designed by Holden and Partners. The station was grade II listed in May 1987. 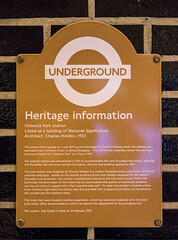 Chiswick Park station Listed as a building of National Significance Architect: Charles Holden, 1933 The station first opened on 1 July 1879 by the Metroploitan District Railway when the railway was extended from Turnham Green to Ealing Broadway. The station was originally named 'Acton Green' and was renamed to 'Chiswick Park' on 1 March 1910. The original station was demolished in 1931 to accommodate the new Piccadilly line tracks, although the Piccadilly line has never served this station, and the new building opened in 1933. The new station was designed by Charles Holden in a modern European style using brick, reinforced concrete and glass. Similar to the station at Arnos Grove that Holden designed for the eastern Piccadilly line extension, the station's predominant feature is the tall semi-circular ticket hall. Externally the brick walls of the ticket hall are punctuated with panels of clerestory windows and the structure is capped with a flat concrete slab roof. 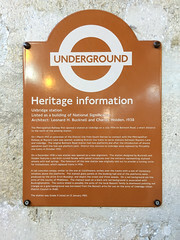 To make the station's location visible from Chiswick High Road the station was also provided with a square brick tower surmounted by the roundel and the stations name. The ticket hall once housed a central passimeter, whcih has now been replaced with the brick built ticket office accommodation which has altered the appearance of the grandiose hall. The station was Grade II listed on 18 February 1987. Northfields Station Architect: Charles Holden & Partners, 1932 The first station opened here in 1905, on the District line, but the present building was constructed as part of the 1930's extension of the Piccadilly line that helped fuel the suburban growth of this once rural part of London. Holden's impressive building takes the form of a single storey plinth, which contains offices and shops, and is faced in black glazed brick. The tall brick box that forms the ticket hall has a window that includes the Underground roundel. The design continues down to platform level, where extensive use is made of concrete, which at the time was a novel concept. 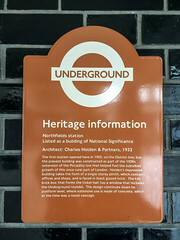 Uxbridge Station Listed as a building of National Significance Architect: Leonard H. Bucknell and Charles Holden, 1938 The Metropolitan Railway first opened a station at Uxbridge on 4th July 1904 on Belmont Road, a short distance to the north of the existing station. 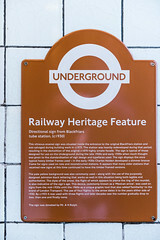 On 1 March 1910 an extension of the District line from South Harrow to connect wth the Metropolitan Railway at Rayners Lane was opened, enabling District line trains to serve station between Rayners Lane and Uxbridge. The original Belmont Road station had two platforms and after the introduction of shared operation each line had one platform each. District line services to Uxbridge were replaced by Piccadilly line trains in October 1933. On 4 December 1938 a new station was opened on a new alignment. The station designed by Bucknell and Holden features a red brick curved facade with paired sculptures over the entrance representing stylised wheels with leaf springs. The forecourt of the new station was originally laid out to provide a turning circle for trolleybuses, which prefaced trams in 1936. A tall concrete canopy, similar to the one at Cockfosters, arches over the tracks with a a row of clerestory windows above the platforms. The stained glass panels at the booking hall end of the platforms were produced by the artist Ervin Bossanyi, and depict the crown and three seaxes. On a red background are the arms of the county of Middlesex. The chained swan on a black and red background is associated with Buckinghamshire. The centre shield is possibly the arms of the local Bassett family (a downward pointing red triangle on a gold background was borrowed from the Bassett arms for use on the arms of Uxbridge Urban District Council in 1948). The station was Grade II listed on 12 January 1983. Sudbury Hill station Listed as a building of National Significance Architect: Adams, Holden & Pearson Partners, 1932 The original station opened on 28 June 1903 on the Metropolitan District Railway extension from Ealing Common to South Harrow. It was rebuilt in preparation of the transfer of services to the Piccadilly line on 4 July 1932. This new extension was, together with the existing tracks back to Acton Town, the first experimental section of the Underground’s surface lines to be electrified and operated electric instead of steam trains. 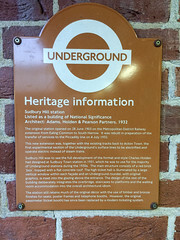 Sudbury Hill was to see the full development of the format and style Charles Holden had designed as Sudbury Town station in 1931, which he was to use for the majority of Underground stations during the 1930s. The main structure consists of a red brick ‘box’, topped with a flat concrete roof. 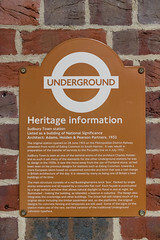 The high ticket hall is illuminated by a large vertical window within each facade and an Underground roundel, with original graphics, is inset into the glazing above the entrance. The design of the rest of the building deliberately integrates the overbridge, staircases to platforms and the waiting room accommodation into the overall architectural idiom. The station still remains much of the original decor with the use of timber and bronze finishes for seats, poster frames and telephone booths. However, the original passimeter (ticket booth) has since been replaced by a modern ticketing system. Park Royal station Listed building of National Significance Architect: Landers & Welsh, 1936 This impressive building situated on Western Avenue, one of the arterial roads built in the 1930s, replaced an earlier station further to the west that had opened in 1905. It was designed, especially the imposing tower with the illuminated roundels, to be a landmark showing the importance of the Underground in the new suburban landscape. 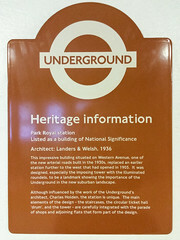 Although influenced by the work of the Underground’s architect, Charles Holden, the station is unique. The main elements of the design - the staircases, the circular ticket hall ‘drum’, and the tower - are carefully integrated with the parade of shops and adjoining flats that form part of the design.